Exterior view from south, showing water garden, exterior of Christ Commons, and main entrance. 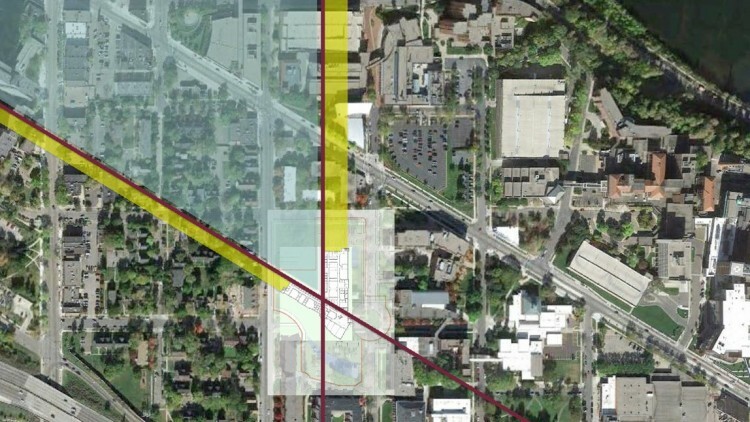 Site plan: Anderson Residence Hall and rain garden are on the left (south). 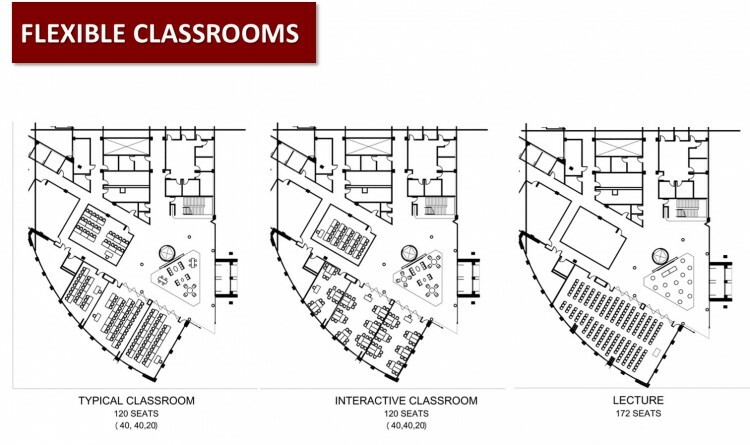 Outdoor learning spaces are shown in the rotunda and adjacent terraces. 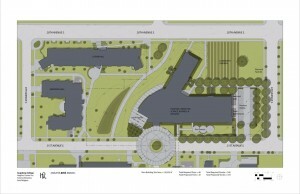 The community gardens are on at the top of the image (to the west of the building). 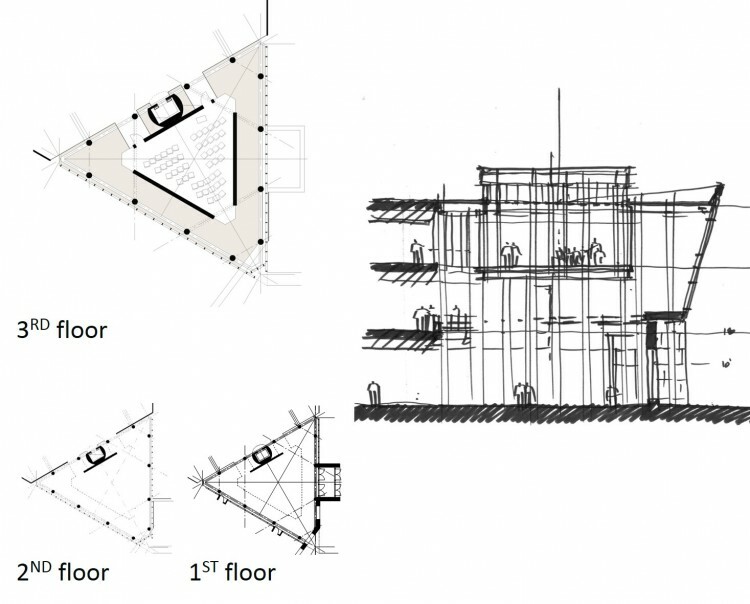 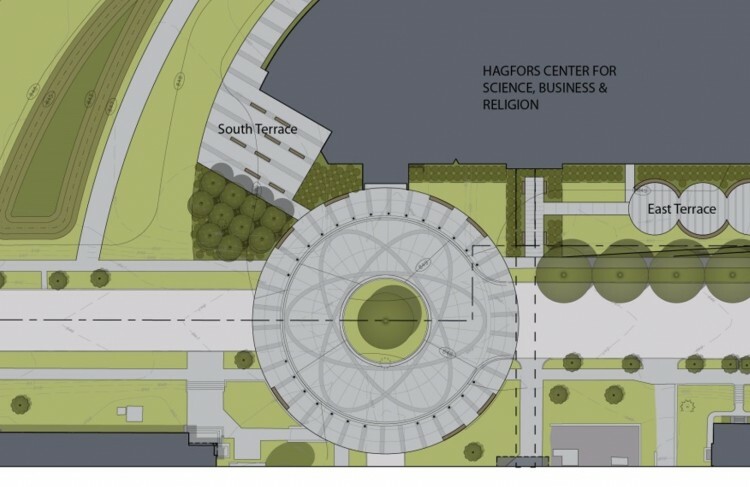 Close up of the main entrance site plan shows the terrace and paved rotunda area. 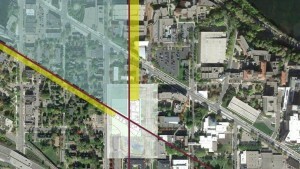 The two wings of the center parallel Riverside and the numbered streets, creating an “open arms” design for the community. 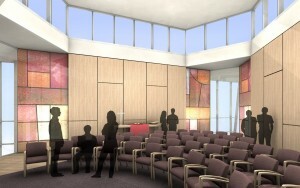 Learning Commons, facing the doors to the Christ Commons classroom space. 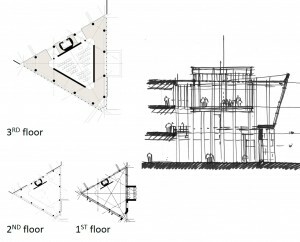 The ceiling of the space is the floor to the suspended Gundale Chapel on the third level. 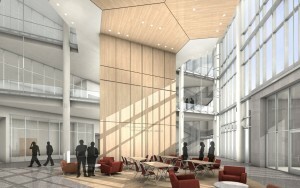 Learning Commons facing the staircase. 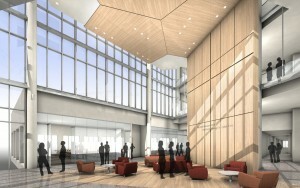 The elevators are behind the two-story wood wall. 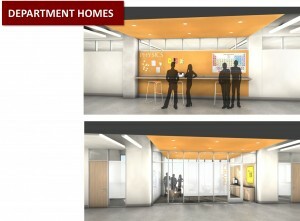 Department “homes” offer designated casual learning spaces. Vertical writing spaces and open walls foster collaboration. The Gundale Chapel on level 3 is designed with natural light and movable seating to accommodate a variety of faith and learning gatherings. 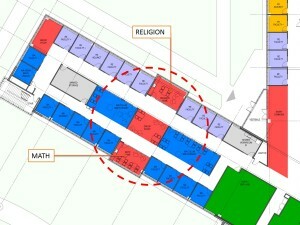 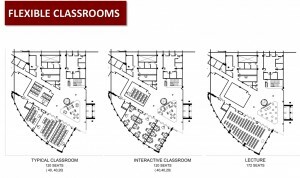 Designated corridor spaces are equipped for casual individual and group learning. 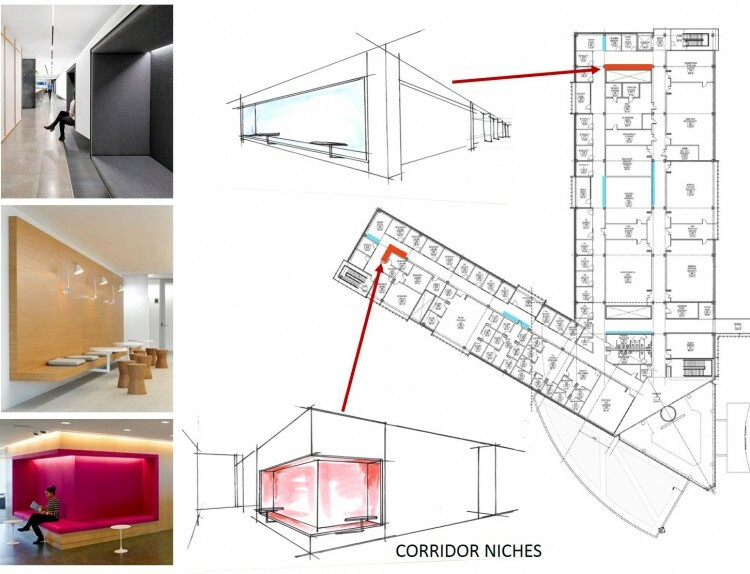 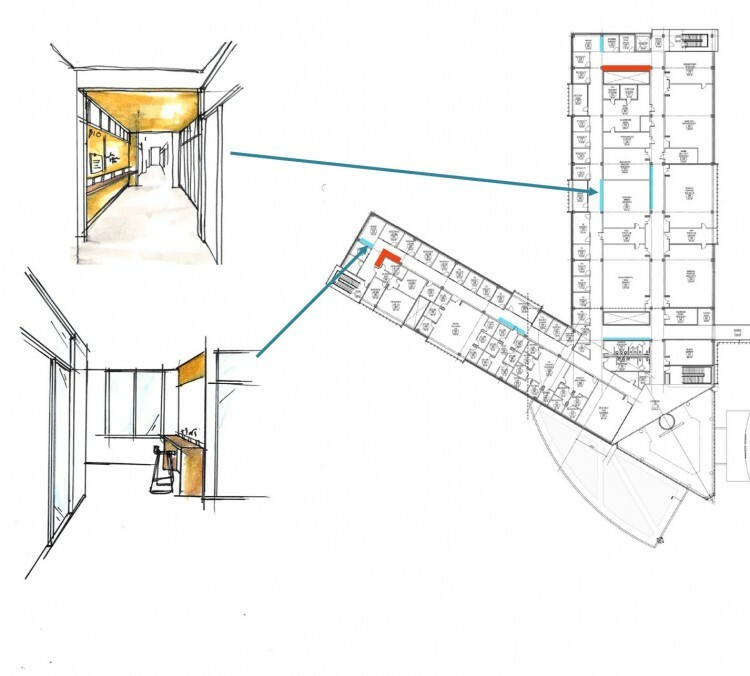 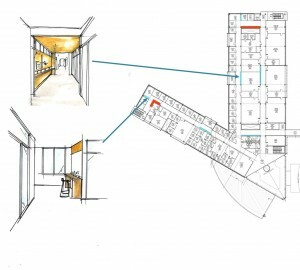 Small corridor niches are equipped for conversation and learning. 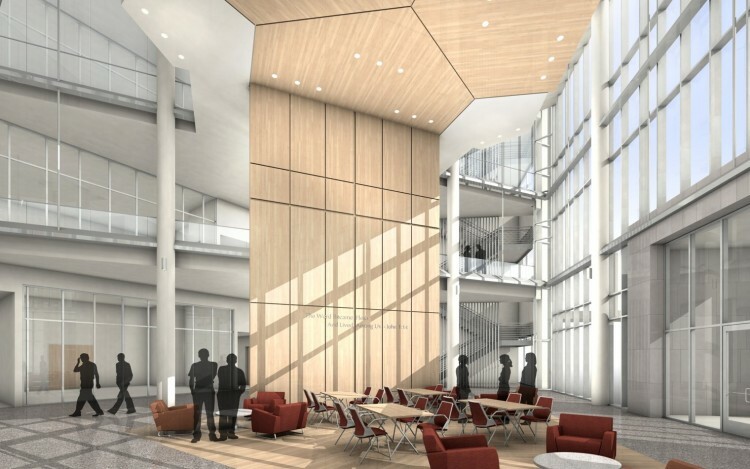 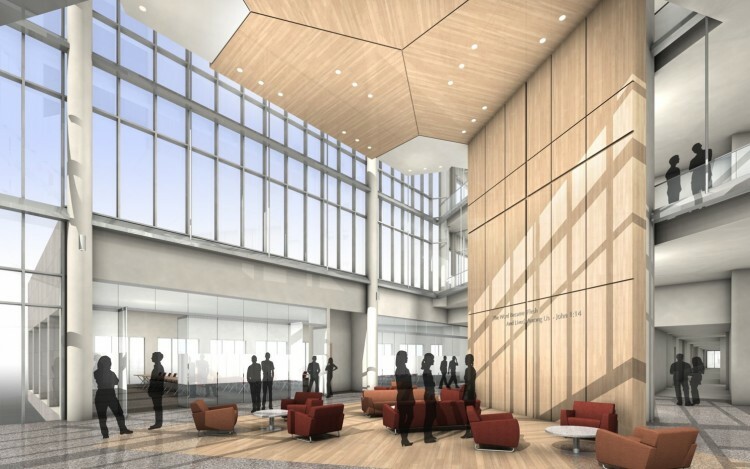 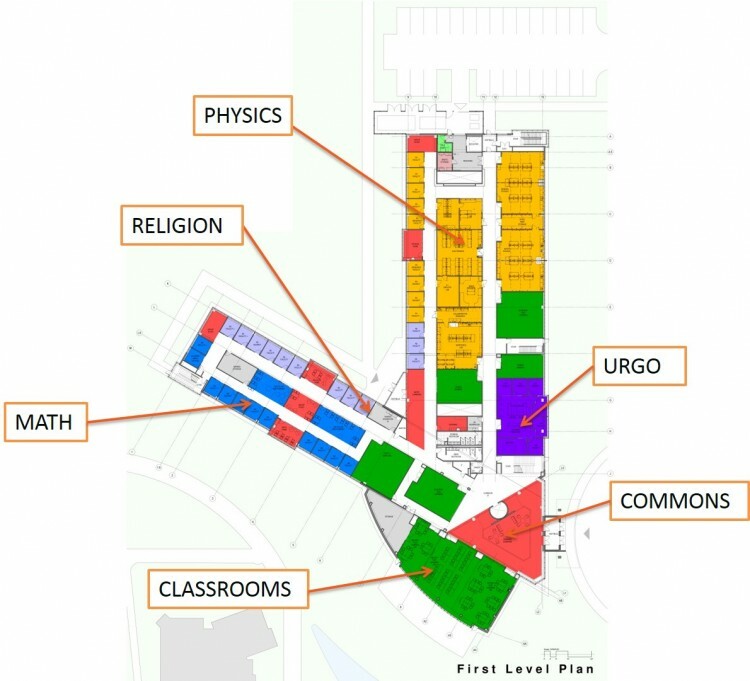 The first level houses the physics, religion and math departments, as well as URGO (the Office of Undergraduate Research and Graduate Opportunity). 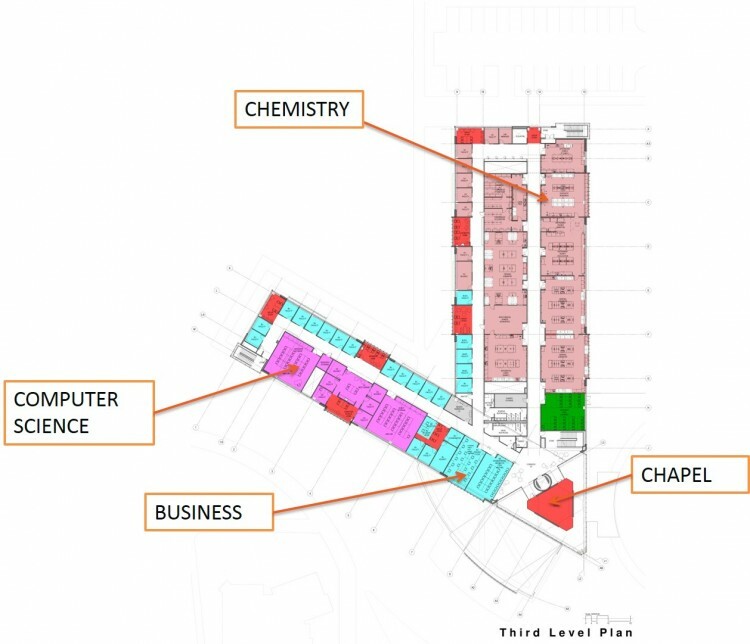 The Learning Commons and Christ Commons classrooms are just inside the main-floor entrance. 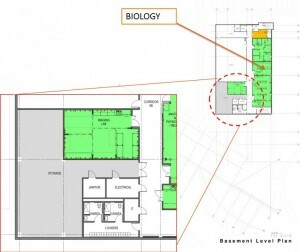 The second level houses the biology and psychology departments. 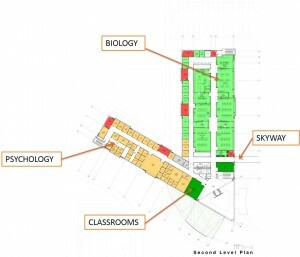 The skyway from Lindell Library connects to the east side of this level. 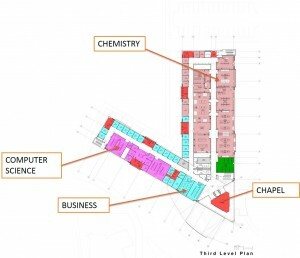 The third level houses the chemistry, computer science and business departments as well as the Gundale Chapel. 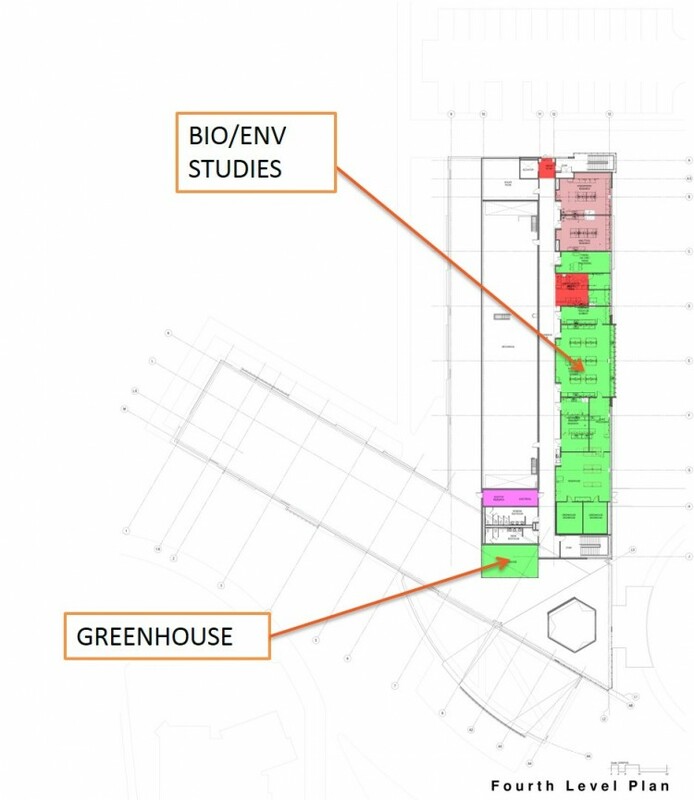 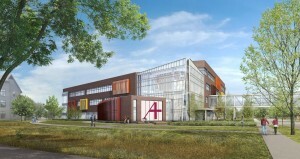 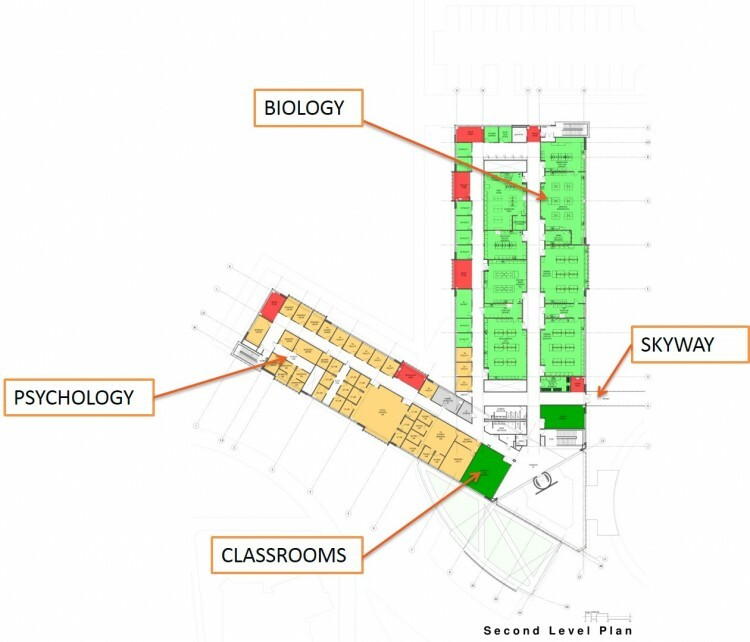 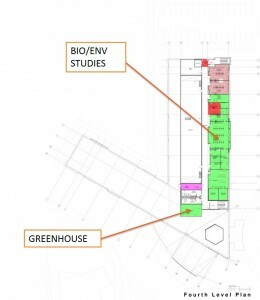 The fourth level is on the north-south wing only and houses the greenhouse and labs for biology and environmental sciences. 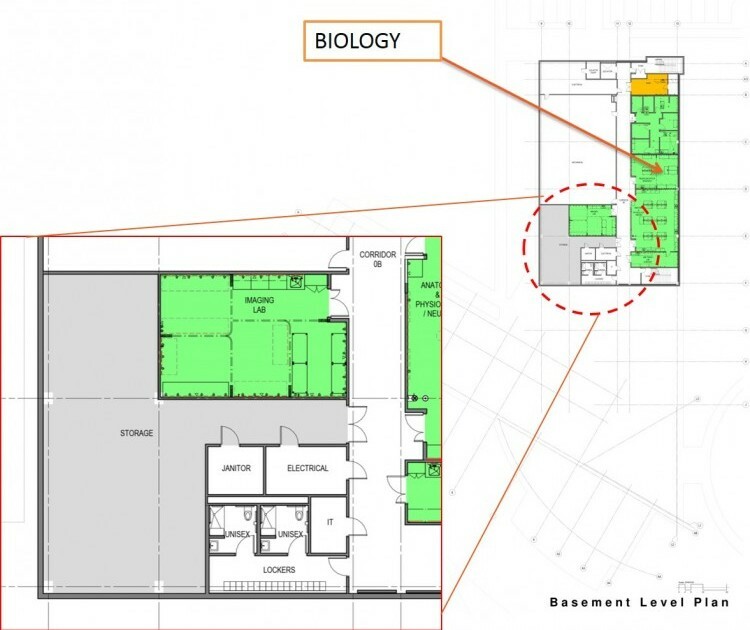 The partial basement space houses labs that require darkness. 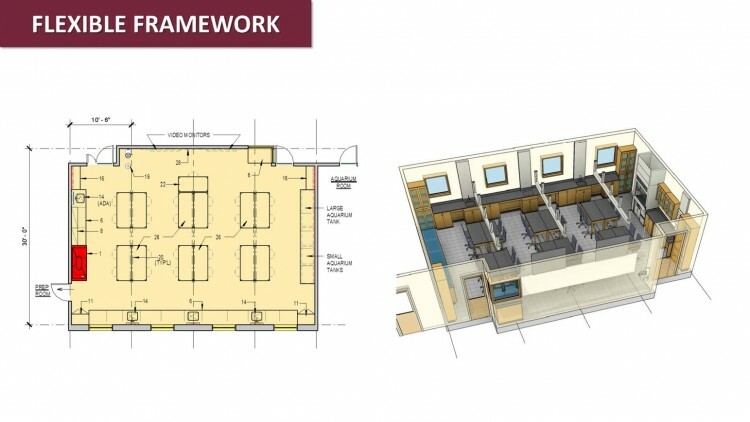 Modular framework allows for long-term adaptability of space. 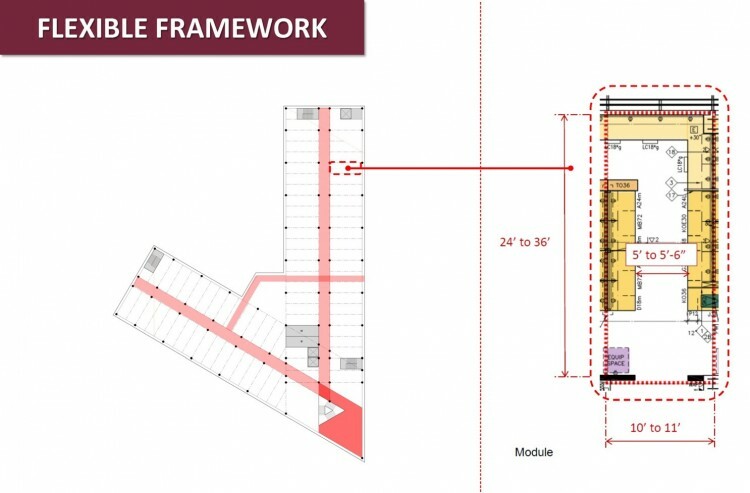 Multiple modules can be combined for specific needs, creating flexibility in space usage. Christ Commons can be configured to support a variety of learning and event needs.